You are currently browsing the Bookmobile News weblog archives for February, 2018. We’re happy to announce another way to support the Free Bookmobile of Sonoma County! 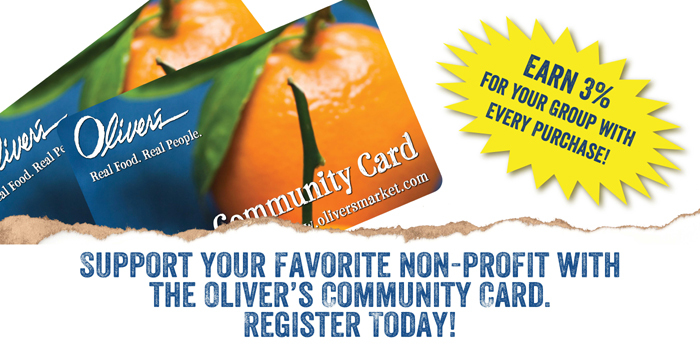 If you’re an Oliver’s Market shopper or have been considering becoming one, you should know they offer a Community Card that gives 3% of your purchase totals to the local charity of your choice. The Free Bookmobile is now one of the programs you can designate as your beneficiary. The best part is that this won’t cost you anything extra, it’s part of the popular eScrip program that helps so many organizations nationwide. It’s easy to sign up: just request a card from any checker at any Oliver’s Market. If you have a few minutes to complete the registration there on-site, your purchase will immediately create dividends for us, as will every shopping trip you make thereafter. Or you can register online later with the number on your new card. Just click here to activate it. More information is available here. Over $300,000 went to hundreds of deserving local charities in 2016, and since the program began, over $2 million has been raised to support our community. Many thanks to Oliver’s for this sharing and for including the Free Bookmobile’s important literacy outreach in their program choices!